With collaboration from our coalition partners, we surveyed state and federal candidates running for the following offices: US Senate, US Congress, Texas House, Texas Senate, Governor, and Lieutenant Governor. Answers provided have been unedited. 2) Under current Texas laws, individuals found in possession of less than one ounce of marijuana can be arrested and given a criminal record, and they face up to six months in jail and a fine of up to $2,000. Do you support or oppose changing state law to make possession of less than one ounce of marijuana a civil offense punishable by a fine and no time in jail? 4) Industrial hemp is genetically similar to marijuana but contains less than 0.3% of the psychoactive chemical in marijuana (THC). At least 34 states have passed legislation related to industrial hemp. The crop can be cultivated around the world for its seed and fiber, which are used in many legal products, such as paper, textiles, construction materials, and fuel. Do you support or oppose changing state law to allow the cultivation of industrial hemp? 3) Please indicate any marijuana related legislation you have sponsored, co-sponsored, or publicly supported. Promoting honest, fact-based dialogue regarding marijuana use and the negative effects of its criminalization. Removing penalties for adults’ possession of marijuana for personal use. Allowing seriously and terminally ill patients to safely obtain and use medical marijuana if their doctors recommend it. 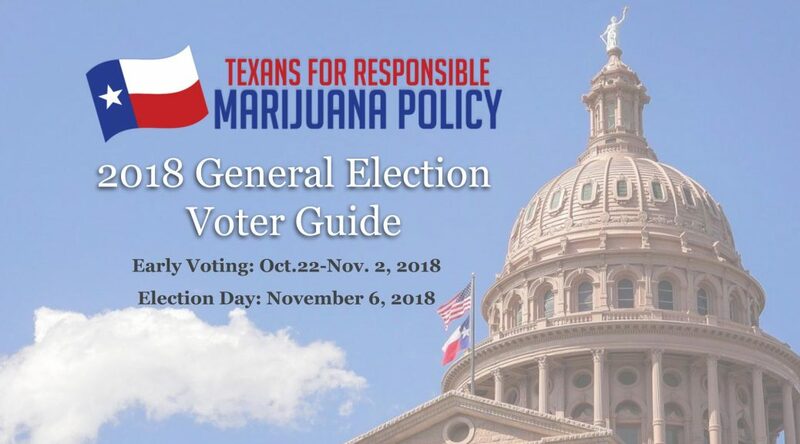 Texas NORML originated the guide in 2012, and we’d like to thank them for helping to put this year’s guide together. Our goal is to help voters make educated decisions when they go to the polls to vote in the 2018 General Election.